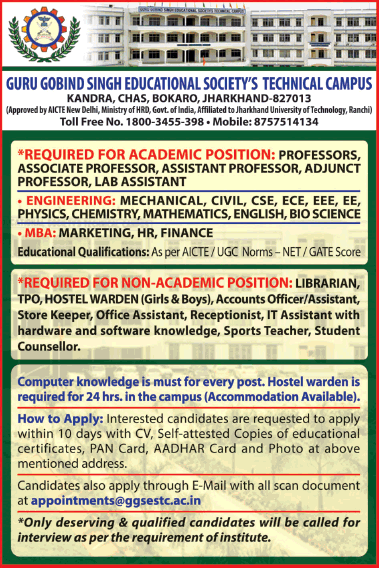 Guru Gobind Singh Educational Society's Technical Campus, Bokaro has advertised in THE TIMES OF INDIA newspapers for the recruitment of Teaching Faculty- Professor / Associate Professor / Assistant Professor / Adjunct Professor Plus Non-Faculty jobs vacancies. Interested and eligible job aspirants are requested to apply within 10 days from 16th January 2018. Check out further more details below. About College: With a range of Under Graguate and Post Graguate programs, G.G.S.E.S. Technical Campus of Education equips teachers and other professionals with practical tools and strategies to apply better leadership, stronger curriculum, and new technology to add value to their school, work, and learning communities. This College is affiliated to Vinoba Bhave University Hazaribag (Jharkhand), also approved by All India Council For Technical Education (AICTE), New Delhi and Ministry of Human Resource Developement, Govt. of India, New Dehli. How to Apply: Eligible and interested candidates are required to send their latest CV with Photograph and self attested copies of certificates, copy of Aadhaar card and copy of PAN card to the college email address or postal address mentioned below.